No season holds as much promise in the air as spring. Flowers bloom, birds sing and leaves begin to fill out the bare branches of trees. The most exquisite colors in nature come to the fore in spring and they bring with them a rhythm, a vibration that resonates with us on a very primal level. You can embody the hope, joy and freshness of spring by making changes to your life, by going for a picnic, going boating in the lake, taking the time to smell the roses and all the other flowers in bloom, or simply by relaxing more and letting life take its course. But by far the most classic way to welcome spring is by infusing your wardrobe with the colors of the season. Now there are thousands of colors – no exaggeration – that remind us of spring. So we’re not going to sit here and debate which is the best because each has its own beauty and music that the other colors in the spectrum cannot match. We will, however, talk about a color combination that we feel is quite perfect for spring wear. We’re talking about the classic yellow and blue combo. Yellow brings to mind the sunshiny days of spring, when every morning is so full of magic that you cannot help but believe with a profound adamance that life is beautiful. Although it’s a stupendous color, it is not given the credence or appreciation it truly deserves. People are not too comfortable sporting this color alone, but they don’t mind pairing it with blue which is why yellow is usually paired with azure or navy blue. As for the blue itself, it serves to tone down a very loud yellow while also refining a look. Blue is a cool, elegant color which is not strictly spring but which is the perfect accompaniment for certain warm spring colors like yellow or even orange. 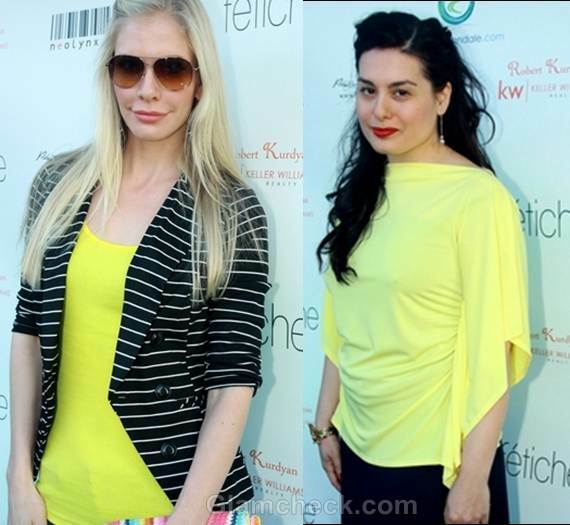 A couple of the celebs who attended the Fetiche Beauty Lounge Party in Glendale, California on March 11 did a fantastic job of pairing yellow and blue in their outfits. Let’s take a closer look so we can get a few pointers on how to wear these magnificent colors. Kelly Harper went Californian casual chic with her yellow and blue outfit. The 33-year-old wore fitted blue jeans with a casual yellow top that had a scooped neckline. She also donned a smart black jacket with ¾-length sleeves and horizontal white stripes. The outfit was accessorized with black pumps, sunglasses, a black beaded bracelet and a rainbow-colored clutch purse. Jessica’s blond hair was straightened and left loose, parted on the left and gently pinned on the right only at the crown. Her lips and cheeks had hues of pink, completing her outdoor spring look. While the yellow and blue are the focus of this look, the colorful purse does does its bit to liven up the ensemble and make it even more fun. This is a great outfit to wear when hanging out with friends or spending the day out shopping. It’s practical, comfortable, low-maintenance and has an easy-to-accomplish style. Here we have a more feminine take on a yellow and blue pairing. 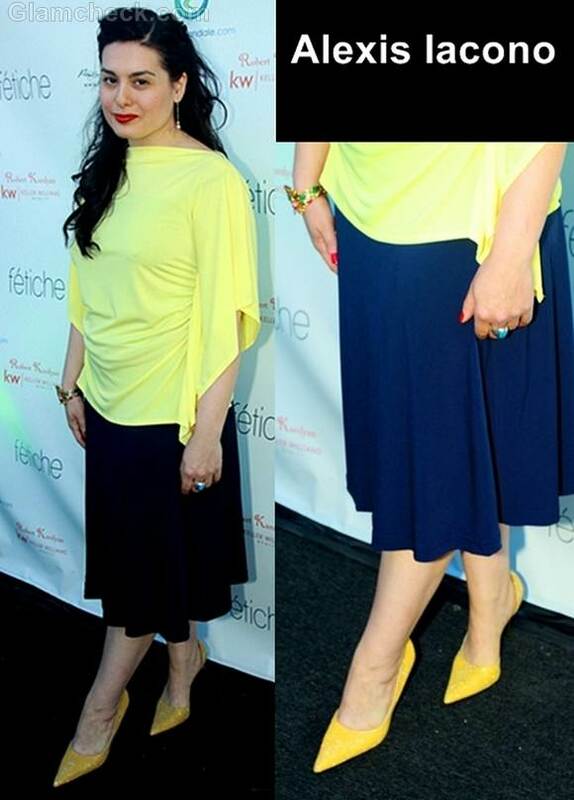 Alexis Iacono wore a yellow blouse with a blue pleated skirt that fell to just below the knees. The loose-fitting blouse and the silky movement of the skirt had a flowy feel that made you think of a breezy day on the patio. The most darling pointy yellow pumps gave the outfit a boost of sophistication while the shimmer contributed a formal element. Alexis accessorized her ensemble with dangle earrings, a teal-stone ring and gold cuff bracelet with red and green stones. Her long, black, messy hair was held back with a simple red clip but otherwise left loose. Bold slashes of bright red lipstick and bright red nails completed her look. This style is cool, comfortable and cheery – ideal for a brunch, a day wedding, or even a semi-formal barbecue. Yellow and blue is a wonderful combination for spring wear, whether day or night. Brighten up your outfit and your mood by getting a few items of clothing in different hues of these lovely colors.